Preheat oven to 200Â°C/180Â°C fan-forced. 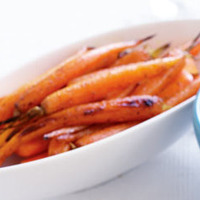 Place carrots in a large roasting dish. Combine lemon juice and ginger in a jug. Drizzle over carrots. Top with butter. Roast for 35 to 40 minutes or until tender. Serve. This looks wonderful! I love ginger with carrots -- a great combination!